Complete selection of bulk vending machines and toy vending machines to start and maintain your vending business. We carry the best selection of durable vending stands and high capacity vending racks. The best stands for your gumball machines. Rhino Vending is a leading manufacturer of vending machines, gumball vending machines, candy vending machines, toy vending machines, and other bulk vending machines for starting a vending machine business, vending machine route, or home vending use. 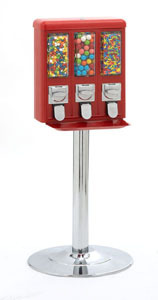 We also carry a complete selection of bulk vending refills from gumballs, bulk candy, jawbreakers, and bouncy balls. Your bulk vending business will be successful with our vending machines. Buy a Rhino vending machine and enjoy the profitability of the bulk vending business and the dependability of a vending machine covered by a lifetime warranty. Start your vending route today with vending machines from Rhino Vending.